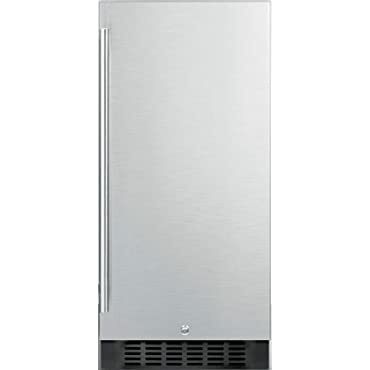 SUMMIT SPR316OS is a versatile all-refrigerator designed for use in residential or commercial outdoor kitchens. At just 15 in. wide, the SPR316OS is ideally sized for built-in installation in any outdoor kitchen, with a fully finished cabinet that also allows freestanding use. The reversible stainless steel door includes a 20 in. long handle for a professional look and a factory installed lock for added security. Inside, the SPR316OS offers 3 cu. ft. of storage space. Three adjustable glass shelves allow easy storage while the floor features slots carefully sized to hold wine bottles in place. This unit includes a digital thermostat with interior controls and recessed LED lighting. Automatic defrost operation ensures low maintenance, while the integrated GFCI cord offers added protection in the outdoors. Sized to fit and designed for convenience, the SPR316OS makes an ideal addition to any outdoor kitchen space. This model is ETL-S listed to NSF-7 standards for commercial use. Color: Stainless steel door/black cabinet. Last updated: April 18, 2019 at 11:53 EST. Pricing information is provided by the listed merchants. GoSale.com is not responsible for the accuracy of pricing information, product information or the images provided. Product prices and availability is subject to change. Any price and availability information displayed on amazon.com or other merchants at the time of purchase will apply to the purchase of the product. As always, be sure to visit the merchant's site to review and verify product information, price, and shipping costs. GoSale.com is not responsible for the content and opinions contained in customer submitted reviews. Coupon Details: Get $46.00 OFF automatically when you add this item to your cart! Regular price of $825.00 will be shown prior to adding it to your cart.